What is the significance of the amount of body area burned? How important is the location of a burn? The skin has an important role to play in the fluid and temperature regulation of the body. If enough skin area is injured, the ability to maintain that control can be lost. The skin also acts as a protective barrier against the bacteria and viruses that inhabit the world outside the body. Dermis, made up of collagen and elastic fibers and where nerves, blood vessels, sweat glands, and hair follicles reside. Hypodermis or subcutaneous tissue, where larger blood vessels and nerves are located. This is the layer of tissue that is most important in temperature regulation. The amount of damage that a burn can cause depends upon the type of burn, its location, its depth, and how much body surface area that it involves. Burns are classified based upon their depth. A first degree burn is superficial and causes local inflammation of the skin. Sunburns often are categorized as first degree burns. The inflammation is characterized by pain, redness, and a mild amount of swelling. The skin may be very tender to touch. Second degree burns are deeper and in addition to the pain, redness and inflammation, there is also blistering of the skin. Third degree burns are deeper still, involving all layers of the skin, in effect killing that area of skin. Because the nerves and blood vessels are damaged, third degree burns appear white and leathery and tend to be relatively painless. Burns are not static and may mature. Over a few hours a first degree burn may involve deeper structures and become second degree. Think of a sunburn that blisters the next day. Similarly, second degree burns may evolve into third degree burns. Regardless of the type of burn, inflammation and fluid accumulation in and around the wound occur. Moreover, it should be noted that the skin is the body's first defense against infection by microorganisms. A burn is also a break in the skin, and the risk of infection exists both at the site of the injury and potentially throughout the body. Only the epidermis has the ability to regenerate itself. Burns that extend deeper may cause permanent injury and scarring and not allow the skin in that area to return to normal function. 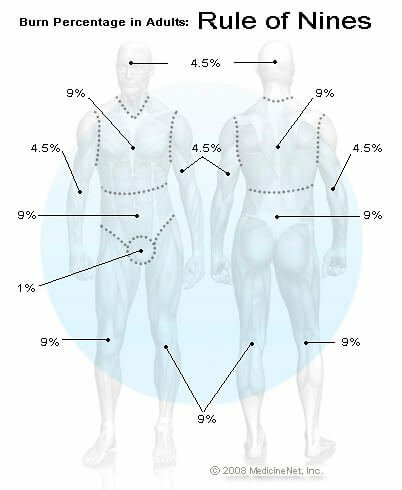 As an example, if both legs (18% x 2 = 36%), the groin (1%) and the front chest and abdomen were burned, this would involve 55% of the body. Only second and third degree burn areas are added together to measure total body burn area. While first degree burns are painful, the skin integrity is intact and it is able to do its job with fluid and temperature maintenance. If more than15%-20% of the body is involved in a burn, significant fluid may be lost. Shock may occur if inadequate fluid is not provided intravenously. As the percentage of burn surface area increases, the risk of death increases as well. Patients with burns involving less than 20% of their body should do well, but those with burns involving greater than 50% have a significant mortality risk, depending upon a variety of factors, including underlying medical conditions and age. Burn location is an important consideration. If the burn involves the face, nose, mouth or neck, there is a risk that there will be inhalation injury and enough inflammation and swelling to obstruct the airway and cause breathing problems. If there are circumferential burns to the chest, as the burn progresses, the tissue involved may not allow enough motion of the chest wall to allow adequate breathing to occur. If circumferential burns occur to arms, legs, fingers, or toes, the same constriction may not allow blood flow and put the survival of the extremity at risk. Burns to areas of the body with flexion creases, like the palm of the hand, the back of the knee, the face, and the groin may need specialized care. As the burn matures, the skin may scar and shorten, preventing full range of motion of the body area. Electrical burns may cause serious injury that is not readily apparent. Often the entry and exit points for the electrical shock may not be easily identified. Electricity flows more easily through tissues in the body that are designed to deal with electricity. Nerves and muscles are "wired" for this task and often are damaged. If significant muscle damage occurs, muscle fibers break down and chemicals can be released into the bloodstream causing electrolyte disturbances and kidney failure. Burns can also occur when chemicals are spilled onto the body and generate a reaction that creates heat. Chemical burns may be classified by their pH or acidity. Acids are those with pH less than 7 and include common household compounds like acetic acid, hydrochloric acid, or sulfuric acid. Bases or alkali compounds have a pH greater than 7. Ammonia is a common alkali found in the home. Remove the victim from the burning area, remembering not to put the rescuer in danger. Remove any burning material from the patient. Call 911 or activate the emergency response system in your area if needed. Once the victim is in a safe place, keep them warm and still. Try to wrap the injured areas in a clean sheet if available. DO NOT use cold water on the victim; this may drop the body temperature and cause hypothermia. Burns of the face, hands, and feet should always be considered a significant injury (although this may exclude sunburn. Gently clean the wound with lukewarm water. Though butter has been used as a home remedy, it should NOT be used on any burn. Rings, bracelets, and other potentially constricting articles should be removed (edema, or swelling from inflammation may occur and the item may cut into the skin). The burn may be dressed with a topical antibiotic ointment like Bacitracin or Neosporin. Silvadene (silver sulfadiazine) topical is the preferred agent for most burns, and is available over the counter in many locations. If there is concern that the burn is deeper and may be second or third degree in nature, medical care should be accessed. Tetanus immunization should be updated if needed. Victims of electrical burns should always seek medical care. Remove the chemical from contact with the victim. Identify the chemical that was involved. Contact the Poison Control Center in your area or your local hospital's Emergency Department. The United States National Poison Hotline is 1-800-222-1222. You will be automatically linked to the nearest poison control center. Many chemical burns may be treated with local wound care. Some chemicals can cause life- and limb-threatening injuries and need emergent intervention. It is recommended that the hotline phone number be stored on your cell phone as well as posted at home and at the workplace. Victims with chemical burns to their eyes should always seek emergency care.